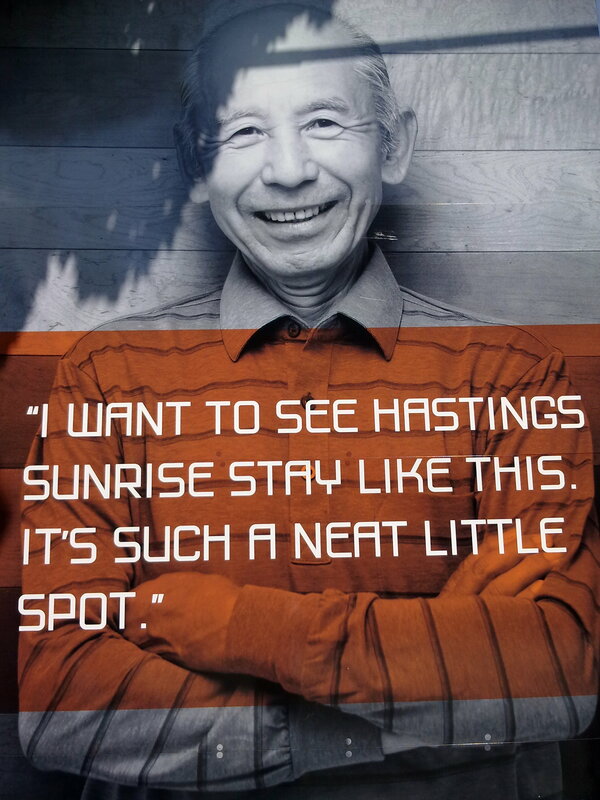 The promotional material for “Alba” -a 108 unit condo development with expanded London Drugs, suggests that Hastings Sunrise is “comparable yet more affordable than Commercial Drive and the ‘SoMa’ area of Main Street.” More affordable? Relatively speaking, sure. But comparable? There’s nothing particularly exciting about this stretch of East Hastings. The recent addition of a few trendy eateries has not changed the low-key character of this low-rent street. There’s no bookstore, no music shop, no refuge for the videophile. The Cultch is quite a ways off, the Waldorf farther still. There was a movie theatre here once –The Roxy, if I recall correctly. The Dairy Queen on Lakewood could claim the distinction of being the location of small time pimp and hustler Paul Snider’s discovery of Dorothy Stratten, but it doesn’t. The strip lacks pizzazz. But it excels at eclectic functionality: delis, butchers, and fishmongers; doctors, dentists and chiropractors; crowded grocery stores of Chinese proprietors conversant in Italian, Portuguese and English; second hand stores of decidedly low end merchandise; a hundred year-old hall; a nondescript sports bar; a tap dance studio; a pool hall; a barber; a cobbler. It is, however, a little less eclectic these days. Once given the green light by their city hall associates, the developer’s modus operandi is pretty clear: 1) an initial distribution of promotional material; 2) clear the target property to generate a sense of forward momentum, of the inevitable; 3) open the sales centre with model suite and collect the pre-sell capital; and, 4) slap the damn thing together (cutting corners as necessary to squeeze a little more margin out of the bottom line). So long as demand and prices are high and rising. But in a slumping market facing an uncertain future, this shtick has apparently encountered a glitch, as fellow Scamcouverite DJKlueless and I recently discovered on a visit to the Alba sales centre. Passing ourselves off as investors -or, possibly, a gay couple- the sales rep jumps to attention, creating the distinct impression that we are the first people to cross his doorway in a fortnight. We’re handed copies of promotional bumpf. Along with the usual asinine quotes and moped lifestyle images are photographs struggling to make the neighbourhood look fashionable, to transmogrify quotidian service availability into something worthy of a minimum of $316,000/quarter century investment. 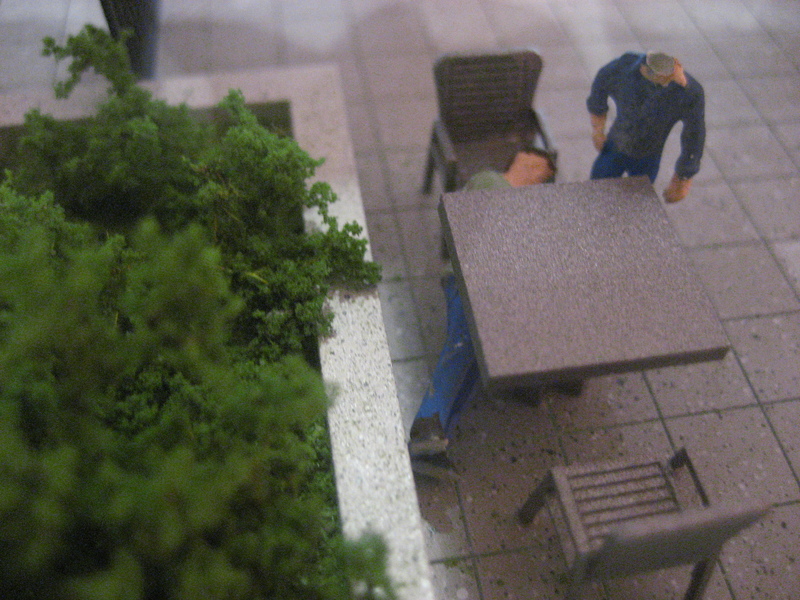 The show suite manages to look simultaneously “lived-in” and sterile and altogether a little too American Psycho. “A great place to have the guys over for the game,” announces Klueless loudly, testing my “cover”. It’s been seven months since the property was cleared, but the building sales map indicates 10 units sold, including one purchased by the builder, with another 11 having offers made –correction, the rep removes a sticker during our chat: 10 standing offers. We take our leave and walk a half block west to Penticton, to the current London Drugs that has yet to be sacrificed to make way for its larger reincarnation. Klueless regularly asks staff when they are to move to their interim location. The answer keeps shifting: it was January, then March, now unclear. 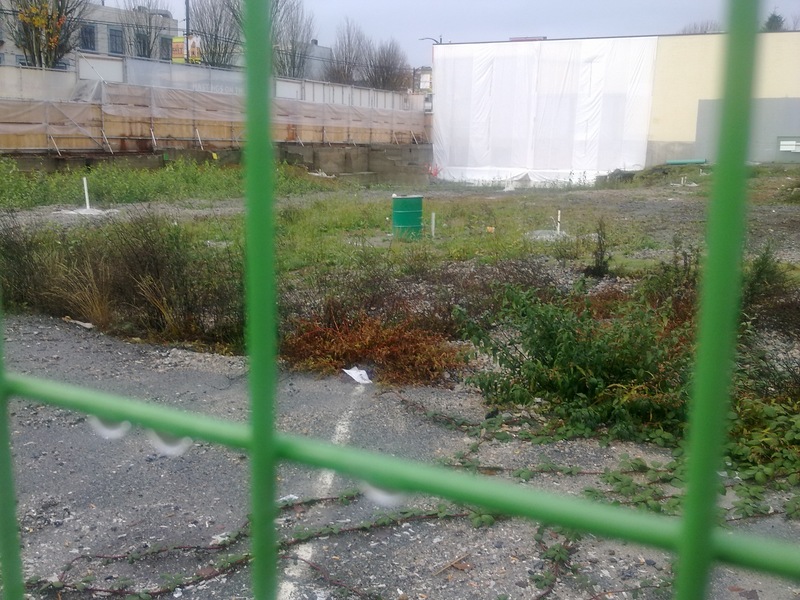 We move north on Penticton then west again down the alley, behind the half-block long Hastings Street hoardings, to a weed covered waste where a dozen storefronts once stood: Happiness Invitation & Greeting Cards, The Art Garden, Windysoul Arts -eclectics lost. There is no discernible security presence. We stroll unimpeded through a ready break in the fence and onto the nascent construction grounds to have a peak at the ghost sign under the west side tarpaulin. We make our way out and around the block to the busy Hastings Street side, where anti-development graffiti has been slowly accumulating on the blank canvas conveniently installed by the builder. Come on and toe the line man! 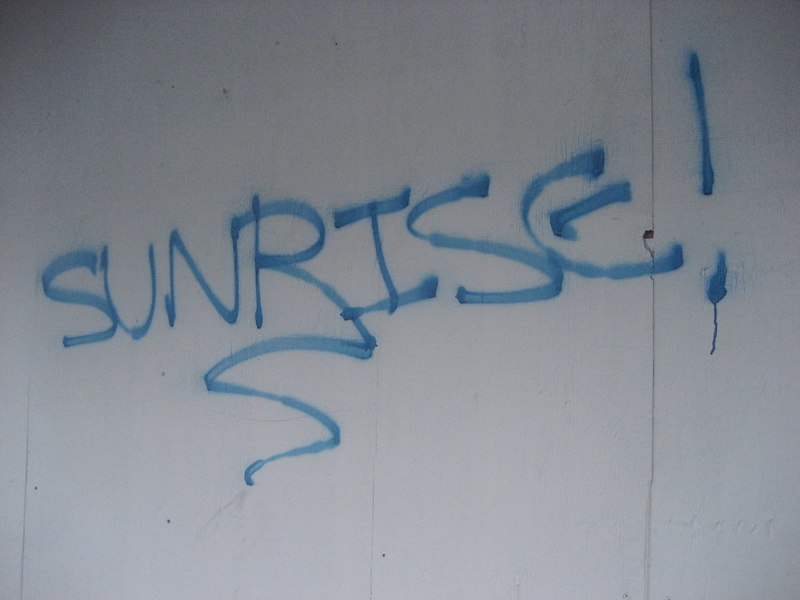 It’s East Village and not Hastings Sunrise anymore. Get with it. Didn’t you get the memo? It’s a “vintage neighbourhood with a progressive attitude” after all. Clearly, I have a problem adjusting. Can you recommend an accredited exorcist or dramaturgist? The Alba’s own material makes no mention of that village you speak of -clearly they didn’t get the memo.